I have been wondering why I haven't been creating much lately. I kept saying I'm busy, but it seems that isn't really the reason. To be honest, my planet has been very chaotic. Stuff everywhere - on my desk and on the floor. And my muse seem to have extended its vacation. That's what's keeping me from playing. Really. So after band practice today, I wanted to start cleaning up and reorganizing my planet as soon as I got home. At least for tonight, I gave myself two hours. And I was able to accomplish two things. 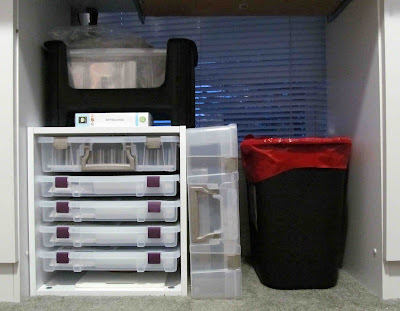 Below my desk, I was able to put together my ArtBin Satchels. I just love their Electronic Cartridge satchel. Let me tell you a secret... I just bought another one today because they are 50% off at Joann's Daffodil Dash Event. Then I decided to put together all of my dies and embossing tools in the left tower of my craft desk. I can say I made some major changes from my previous system. And I think this new one will work a lot better. Starting from the top shelf are a mix of dies and small embossing folders. Below that are my Sizzix dies. The A2 and bigger embossing folders are on the third shelf, organized by brand. And the next two shelves are mostly Spellbinders dies and embossing folders. At the bottom are two CD boxes, where I put my blank A2 card bases and bling. You can see some long dies tucked on the left as well. I'm really serious about cleaning my planet. And I want it done as soon as possible. I'll keep you all posted. I know exactly how you feel Joan, as I´ve been the same lately, and just don´t seem to get anything done, and I even can´t complain about my space LOL. I really hope, you´ll get back to what you love soon, as we all miss to see your wonderful creations too, and maybe they could help me get my energy to do more back too LOL.